Nissan Pao For sale UK Registered direct from Japan including all models and colours imported and supplied by Algys Autos Ltd, THE Best Value in the UK. FACT. 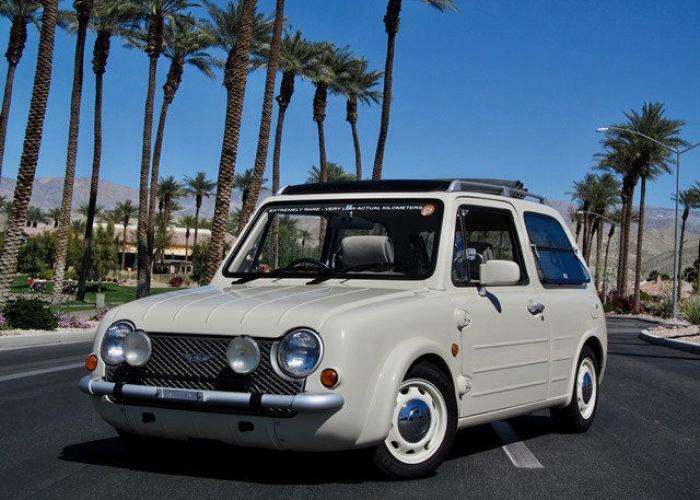 Your search for the best quality and prices Nissan Pao for sale in UK starts and ends here! 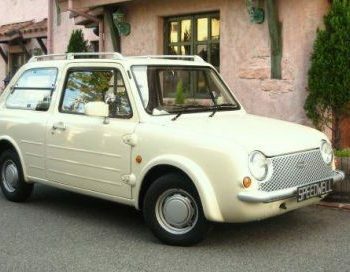 All our Nissan Pao are available via our unique ‘Import Scheme’. 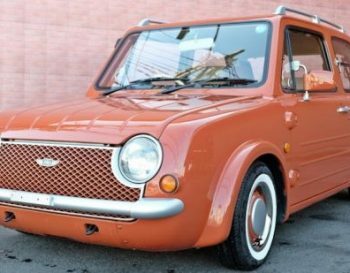 Nissan Pao for Sale in the UK Via Algys Autos. See advance notification of Nissan Pao for sale by sending us an email from ‘Contact Us‘ Page or Email links on this page. 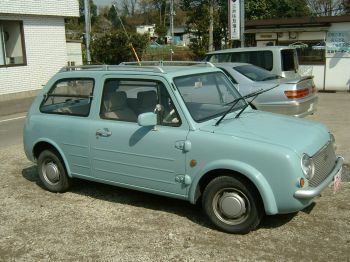 The 3rd and final delightful ‘Retro Car’ of the Pyke Dynasty, the Nissan Pao. Manufactured from 1989 until 1991. 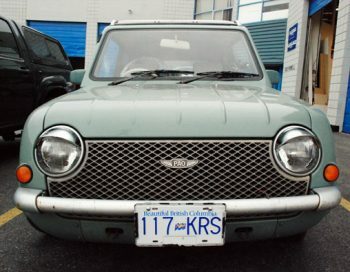 A small retro station wagon. A small but roomy, 5 seater/ 2 doors coupe, 1000cc petrol engine, available in a rare manual 5 speeds transmission or more common 3 speed automatic It has all the modern features of Air-conditioning, power steering, Nissan Pao retro radio cassette. Available for sale in Colours Green, Cream, Blue or Terracotta. Truly a lovely car to drive and sure to turn heads wherever she goes! A genuine 4/5 seater with a small boot and loads of fun! 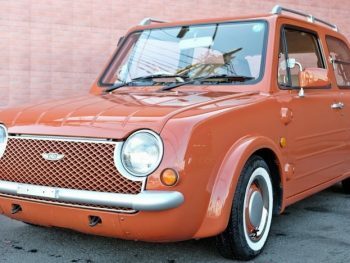 The Nissan Pao is for sale in Terracotta, Ivory, blue or green, there are alsp bespoke colours sometimes seen for sale that have been customised by Nissan Pao enthusiasts. 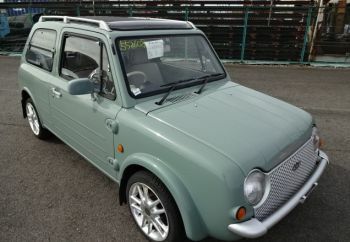 The nissan Pao has rapidly become a very collectable little clasic retro car and prices for good ones are now upwards of £5,000 OTR UK registered. 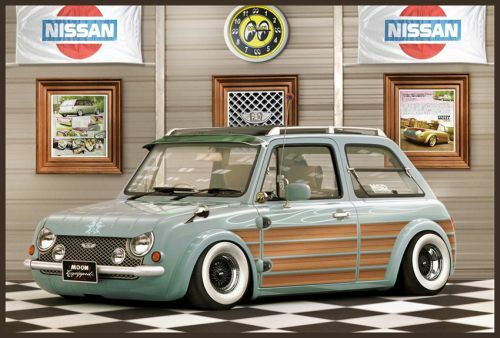 That’s simple, Algys Autos import fresh Nissan Pao stock direct from our Japan garages NOT from very inferior UK auctions or from Nissan pao circulating for sale within the UK. Most UK traders buy their Nissan Pao from the used UK market, generally these Pao are tired and have been subjected to the cruel and harsh winter roads and conditions. Ask to see the Japanese auction sheet and proof they imported it from Japan…..if they can’t or won’t provide it, turn around, walk away and come to the experts. Contact us via email and ask for any details of Niossan Pao for sale in Japan that can be imported by us into the UK. If you compare Algys Autos prices of Nissan Pao for sale within the UK you will recognise that Algys Autos is, without doubt, the best ‘Value for Money’ in the UK, You will note that the prices are offered via the ‘Import Scheme’. The Import Scheme was a brain-child of Algys Autos over 20 years ago and many have tried to copy it with little success. The other traders even refer to the idea as the Import Scheme (conveniently dropping the ‘Algys Autos’ of course). 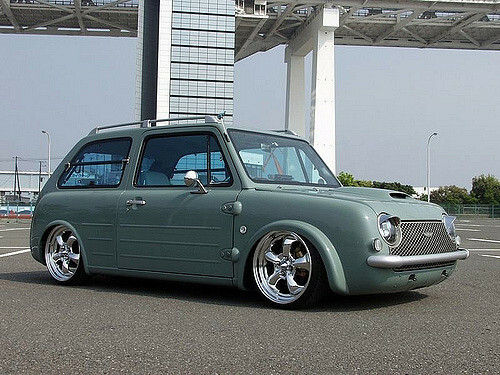 The Import Scheme is where Algys Autos allows you to bring you chosen Nissan Pao into the UK as a ‘Private Importation’ and thus saves £1000’s. 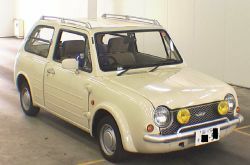 We buy any model of Nissan Pao offered for sale in Japan to your detailed requirements under this scheme via our Garages in Japan. If you contact us for our current stock list of Nissan Pao for sale you will also get the opportunity to see what Nissan Pao are for sale in Japan to be fully UK registered for you. 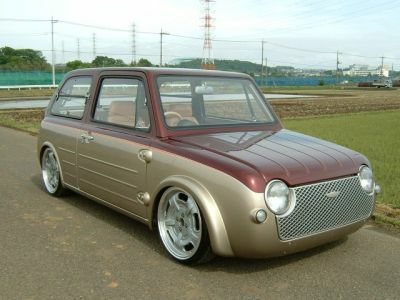 See the Nissan Pao for sale of your choice in the comfort of your own home to see time and again. These is NO obligation to our email service, advice or the YouTube videos. 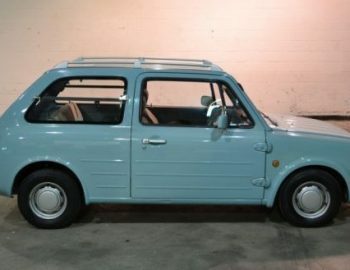 There are 4x original colours of the Nissan pao for sale; Terracotta, Ivory, Green and Blue. The Terracotta is by far the rarest and so commands the most monet when offered for sale, next is ivory and then the 2 remaining colours of blue and gree, there is also a manual gearbox as well as auto, the manual is very rare and so again demands a higher sale price. Lastly there is a sunroof option, again quite rare. 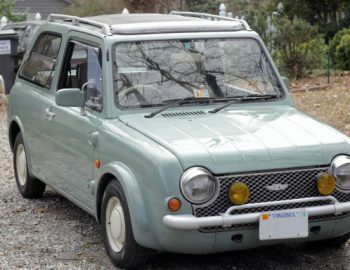 So depending on the combination of these factors will determine the value if the Nissan Pao offered for sale in Japan and of course its worth later in years! Send us an Email Now and advise us what model of Nissan Pao you want from Japan to the UK supplied UK Registered of course! Algys Autos Ltd is by FAR the best UK value Nissan Pao for sale available!! How? We have garages in Japan and UK. NO middle-men. We have the FULL infrastructure in place and we are not greedy. £350 profit per car SIMPLE. Try asking another dealer how much profit he’s made on a car!